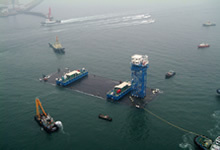 Offshore Engineering | Business Activities | FUKADA SALVAGE & MARINE WORKS CO., LTD.
With the advancement of society comes the reclamation of ports for land, construction of artificial islands, and an otherwise ever-changing coastal environment. And with a push for more maritime logistics and guaranteeing safety, dredging shipping lanes and removing harmful objects is important work. We are involved in a wide variety of offshore engineering projects for port maintenance, especially involving the installation of caissons, which form the bases of seawalls. We recently overhauled our Etajima Warehouse and will provide sufficient equipment and construction abilities to allow them to handle a series of work for us, such as breakwater plate and caisson construction. Offshore engineering construction takes place while being belted by winds, waves, tides, and Mother Nature. You need a cool head that comes from years of experience to work safely in this unique environment. 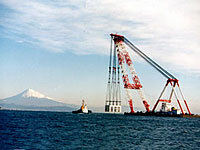 Fukada Salvage & Marine Works, which has always worked on the sea, has fostered its long years of experience and worked hard to become the most trusted marine construction company around. Japan has many channels, straits, and waterways, all connected by bridges and undersea tunnels, so immersed tunneling methods are sometimes used when building undersea tunnels. 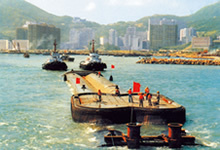 Here, massive caissons (boxes) are embedded on the seafloor and connected, which form an undersea tunnel between land masses. We use our technology to tow and embed these caissons – we have been involved in virtually all immersed tunnel construction in Japan. We are proud that our accomplishments bear testimony to our seasoned experience in handling massive structures at sea and the high praise for our construction abilities.